Background Traditional approaches to research can sometimes face difficulties in engaging participants, being flexible and ultimately eliciting data about people’s experiences. Visual methods are alternative approaches that use image – often photographs – as stimuli or structure in interviews. However, little has been published in the literature to guide nurse researchers in applying and evaluating these methods. Aim To increase nurse researchers’ awareness of visual methods and their potential. Discussion The paper explores visual methods, with a focus on those that use photographs. It discusses the benefits of using photographs in research, such as reducing the gap between the researcher and participant and helping participants to express meaningful data. It also examines associated ethical, analytical and practical difficulties. The paper illustrates discussion points with reflections from research and compares interviews that do and do not use photographs. Conclusion Using photographs is a good alternative to more traditional approaches but the exact benefits are difficult to evidence because of the complexities of the interactions involved. 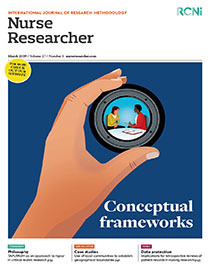 Implications for practice This paper should increase nurse researchers’ awareness of visual methods, help them to make informed choices about research methods and encourage the use of visual methods in health research.